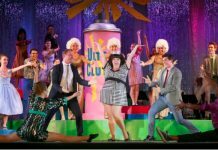 Vancouver Presents’ contributing editor, Mark Robins, went live with the company of Guys & Dolls for a sneak peek and interviews with the director and actors. Things may be cooling off outside, but at Granville Island’s Waterfront Theatre things are just heating up as Fighting Chance Productions presents the classic musical, Guys & Dolls. This Tony Award and Pulitzer Prize-winning musical first hit Broadway stages in 1950 and has since gone onto see a number of revivals, and countless regional productions. It was also made famous in the 1955 film version, starring Marlon Brando and Frank Sinatra. Set in New York during the Depression, Guys & Dolls is the overlapping stories of high-roller Sky Masterson, who falls in love with mission worker Sarah Brown, and lovable rapscallion Nathan Detroit, engaged for fourteen years to club singer Miss Adelaide. 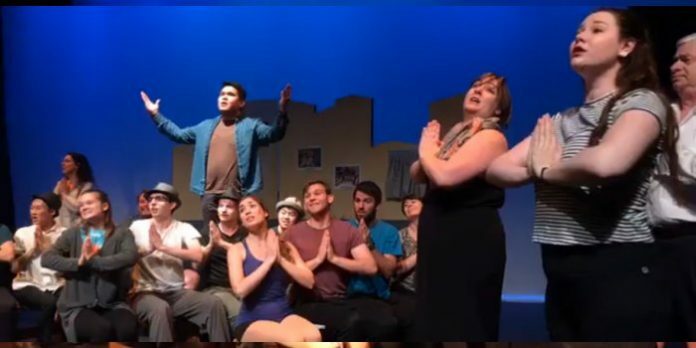 Vancouver Presents’ contributing editor, Mark Robins, went live with the company for a sneak peek at one of the more famous numbers from the show, as well as interviews director Jenn Suratos, and cast members Ranae Miller and Scott McGowan. Guys & Dolls plays the Waterfront Theatre on Granville Island August 3-25. Visit fightingchanceproductions.ca for tickets and information. We are LIVE at the Waterfront Theatre on Granville Island with the company of the Fighting Chance Productions presentation of Guys & Dolls.Be sure to hit Like and Share as the cast performs a number from the show and then stick around for an interview with director Jenn Suratos, and cast members Ranae Miller and Scott McGowan.Guys & Dolls plays the Waterfront Theatre on Granville Island August 3-25. Visit http://www.fightingchanceproductions.ca for tickets and information.